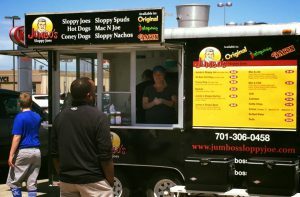 Jumbo’s Food Truck. Let’s face it, there are times when you want to leave the office for a quick, delicious lunch. There are other times when you’ve got a big event and you don’t want to go through the time or effort to cook for 50, 100 or more people. There are other times when you want to take advantage of the street food craze that’s hitting the nation. In any case, we’ve got you covered. 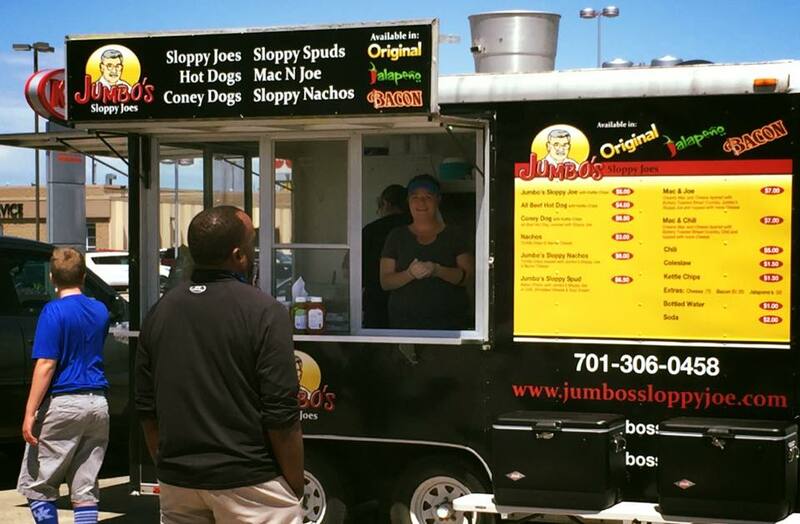 At Jumbo’s Food Truck, you can experience the delicious taste of Jumbo’s Original, Jalapeno or Bacon Sloppy Joe sauce just they way that they were intended to be enjoyed. Enjoy them as a Sloppy Joe or add an all-beef frank for the best Coney Dog you’ve ever had. However you order it, you will have it served up on a buttery-toasted bun with a generous, heaping helping of Jumbo’s famous Sloppy Joe Sauces. Add kettle-cooked potato chips and an ice cold soda pop to any of these sandwiches for a basket that you’ll come back for again and again. In the mood for something different? Try our Sloppy Spud. It starts with a delicious baked Red River Valley potato. We open it up and stuff it with Jumbo’s Sloppy Joe Sauce and top it with cheese and sour cream. Choose from Original, Jalapeno or Bacon. It’s a meal you won’t soon forget. How about some comfort food? Jumbo’s Mac’n’Joe fits the bill. Creamy, gooey made from scratch Macaroni and Cheese, topped with a generous dollop of Jumbo’s Original, Jalapeno, or Bacon Sloppy Joe Sauce. We top this creation with buttery toasted bread crumbs, and finish it off with your choice of shredded or nachoe cheese before handing it over for you to dig into. Your tummy will be happy with this one! Call us at (701) 306-0458 to be a part of your next event, or follow us on Facebook or Twitter to see where you can find us for lunch or supper!